The Fırtına Valley which runs through the heart of Çamlıhemşin is spanned by the Ottoman-era Fırtına River bridges. The valley ıs located near Rize in the far north east of Turkey. Çamlıhemşin is high in the valley, which leads down to the Black Sea coast, and is an important access point to the Kaçkar range whose high mountains poke up into the clouds. Fırtına means Storm and although it rains here all year round, temperatures can fall to minus 7°C in winter and reach 25°C in summer. However the countryside is a gorgeous mix of meadows and valleys and in recent years the district has begun to attract touristsö especıally people on trekking holidays in the Kaçkar. Çamlıhemşin is a low-income district and people live from forestry, beekeeping or herding animals. 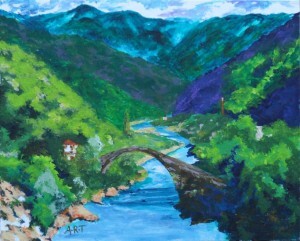 This entry was posted in Living in Turkey and tagged Art, Black Sea, Fırtına, Kaçkar, my paintings, Rivers on June 9, 2013 by Tony Taylor. A Lighthouse on a sunny day is a bit useless other than as as a navigation mark or a tourist attraction, so my final interpretation of Gelidonya creates the storm that defines it’s existence. 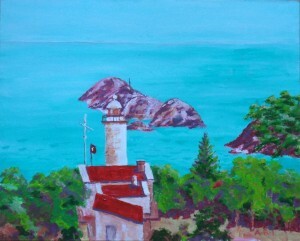 I’ll possibly come back to Gelidonya again but I must get on with the larger canvas of Fethiye bay. The temperatures have soared to 35C + in the last couple of days, not a great time to sit in full sun so I need to rig up some shade on the hillside before I can get on. It’s very steep and rocky there so I need to get my thinking cap on. 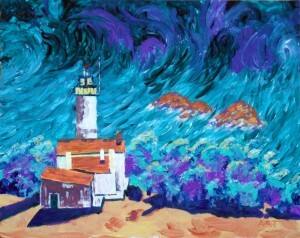 This entry was posted in Fethiye, Living in Turkey and tagged Acrylics, Art, canvas, Fethiye, Gelidonya Lighthouse, Lycian Way on May 1, 2013 by Tony Taylor. Cultural Connections is an annual celebration of literature, film, art, music, dance and food… all the stuff of life that links humanity throughout the world. Both stimulating, challenging, occasionally provocative and always fun, Cultural Connections is an excitingly different and thought provoking way to explore the things that bring people together. This five-day event, Kayaköy Connections 2013 will celebrate the Kaya valley in southwest Turkey, its long history, rich culture and links with Greece. Acclaimed authors Louis de Bernières, Victoria Hislop, Jeremy Seal will be travelling from the UK and Sofka Zinovieff will be joining them from Athens. Others, from Turkey, Greece, yet to be decided, will join them to take part in a range of thought provoking, fun and entertaining events and gatherings. 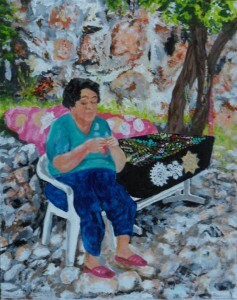 This entry was posted in Kayaköy, The Arts and tagged Acrylics, Art, Festival, Kayakoy, my paintings on March 16, 2013 by Tony Taylor. Mostly the light is harsh and unforgiving, it comes from directly above so doorways and windows become black holes. Then again, the sun shines on the white plaster of an internal wall and the window opposite beams like a searchlight. Other days the light is hazy and diffuse, and there isn’t much contrast, shadows get bleached out, then there are no really dark areas and the light bounces off the stone into the shadows. The walls have eroded into dark and light areas that are independant of the light. So a vertical dark band on a facing wall gives the impression of a shadowed side wall which would naturally be light (if it was there!). And all the walls are like that. 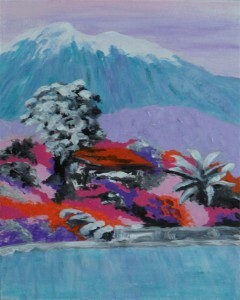 Its very confusing to the eye and I struggle to resolve it without losing realism. For example, the apse(in shadow) is lighter than the side wall of the church (in the light) and the pink plastered walls actually seem to glow It’s very tricky. 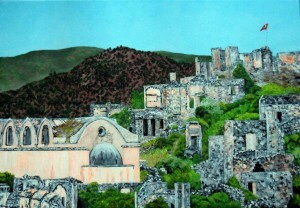 On the other hand it’s one of the things that make Kayakoy so visually fascinating to me. 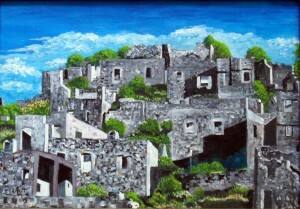 This entry was posted in Kayaköy, The Arts and tagged Acrylics, Art, canvas, Kayakoy, my paintings on March 12, 2013 by Tony Taylor.